Has Your Backflow Been Tested? A backflow device installed on a plumbing system assures the unwanted reversal of possible contaminated or pollution into the public clean water supply. 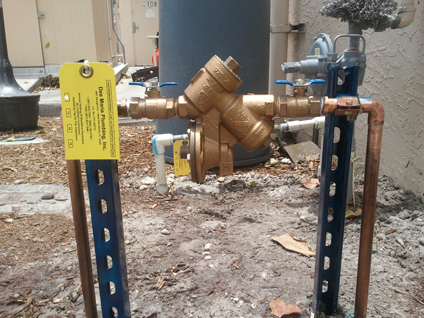 Backflow usually happens when there is a pressure fluclation in the plumbing system. Backflow systems are vital to keeping our water safe. The backflow system should be tested once a year and in most municipalities it is required. Our licensed backflow technicians are equipped with the proper equipment to install, repair and recertify backflow devices.